NEW YORK (WABC) -- Two New York City police detectives have been indicted on assault charges after they allegedly assaulted a uniformed U.S. Postal employee who had just finished a shift in October of 2015. Queens District Attorney Richard Brown and NYPD Commissioner William Bratton announced the grand jury indictment Wednesday, and that one of the officers perjured himself when filing a sworn criminal complaint with the court. The officers -- 31-year-old Angelo Pampena, a nine-year veteran of the force, and 29-year-old Robert Carbone, an eight-year veteran -- were previously assigned the NYPD's Patrol Boro Queens North Gang Unit. They are now facing a five-count indictment. Pampena is charged with second- and third-degree assault, second-degree perjury, first-degree offering a false instrument for filing and official misconduct, while Carbone is charged with second- and third-degree assault. According to the charges, the detectives approached then-26-year-old Karim Baker, who was still in uniform, on the evening of October 21, 2015, after he had just entered his parked personal vehicle in Corona, Queens. 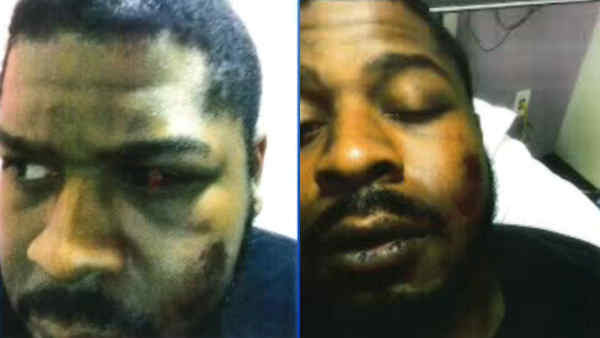 While Baker was seated in his vehicle, it is alleged that the two detectives punched and kicked him multiple times about his face and body, and that they then dragged him from the vehicle and onto the sidewalk. Baker suffered serious physical injuries. Prosecutors say Pampena then filed a sworn criminal court complaint that Baker was parked directly in front of a fire hydrant. Video evidence, however, allegedly showed that the vehicle was parked more than the required 15 feet. Baker claims he was being harassed for unwittingly giving directions to a gunman who went on to kill two NYPD officers. He was first questioned by police during the investigation into the murders of Detectives Rafael Ramos and Wenjian Liu by Ismaaiyl Brinsley the previous December. "I was being harassed, like cops outside by door and my family members' doors, friends' doors, just everybody," he told Eyewitness News last November. "I felt just some type of way." The detectives are both suspended without pay. If convicted, they each face up to seven years in prison.